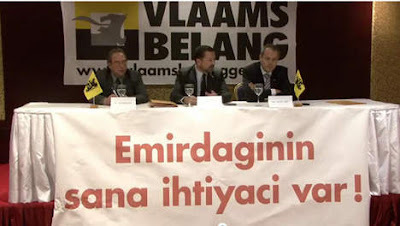 The Vlaams Belang party of Belgium, a right-wing political party that aims for an independent Flanders, has started a campaign of remigration in order to convince those immigrants who do not adapt to Flemish society to return home. The Turkish motto of the campaign the Flemish party has been conducting is “t,” (Emirdağ needs you), while the general motto addressing all immigrants is “Return happily to your home country.” Fliers carrying the mottos have been distributed to thousands in Flanders. Johan Deckmyn, who is one of the group members and a member of parliament in Flanders, said at a press conference held in Ankara on Wednesday they are in favor of remigration of immigrants who cannot integrate in society in Flanders. “If Turks don’t want to re-migrate, they should integrate into our society,” he stated. Asserting that they were not anti-Turkish or racist in any way, Deckmyn has complained that there are too many immigrants in Flanders and that the immigrants do not integrate into Flemish society. “A lot of Turks in Ghent have problems adapting and learning the language. There are Turks who have been living in Flanders for thirty years and don’t speak Flemish,” he complained. Deckmyn also noted that Turks in Flanders have been complaining about Roma arriving in large numbers from Bulgaria and Romania in recent years, the newcomers being criticized for not adapting to the ways of the local society.